Description: Although it is likely that Hereford Cathedral has enjoyed the provision of an organ since pre-reformation times, the earliest recorded instrument is one by Renatus Harris, dating from 1686. The specification is not known, but doubtless consisted of a sizeable Great with a smaller scale Choir division. Over the next 150 or so years, the organ gained a short compass Swell and pedals were added in 1806. By 1832, the organ had passed into the care of J.C. Bishop, who undertook a major restoration under the auspices of Samuel Sebastian Wesley, whose extended anthem The Wilderness was first heard at the re dedication service in November of that year. Bishop continued to look after the instrument during the middle part of the 19th century and he was responsible for moving the organ to the college of the vicars choral in 1841 whilst major structural work was undertaken in the Cathedral. This work took many years to fully complete and in 1861 the decision was taken to enlarge the organ significantly and make good various deficiencies. The precentor of the day, Sir Frederick Arthur Gore Ouseley rejected a proposal from J.C. Bishop, choosing instead to offer the work to Gray and Davison, who were then one of the country's leading organ builders. The Renatus Harris case disappeared at this time, with the pipe rack and case we see today being built to a design by Gilbert Scott. Work on the new instrument took longer than anticipated and the organ was finally ready in June 1864, the first anniversary of the re-opening of the Cathedral. The pneumatic action appears to have given trouble within two years and, after the decision was taken to dispense with Gray and Davison's services, John Nicholson of Worcester was engaged to effect repairs in 1868. Then, in 1878, the precentor and organist submitted a report to the Dean and Chapter, calling for various “prepared for” registers to be installed (including the 32' Open Wood), along with provision of a new Solo organ. This was all thought to be possible for £700, although it was recognised that additional work would be needed for repair and reconstruction of the blowing plant. It was at this point that Henry Willis was approached, whose thorough report proposed a scheme that was somewhat more involved and costly than anticipated. 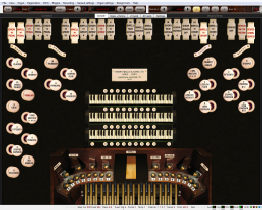 To achieve a successful outcome, Willis wanted to replace much of the action, keyboards and winding as well as a major re-ordering of the organ's internal layout. His quotation of £1300 also allowed for the tonal additions and revoicing of existing material. It was accepted by the Dean and the work was completed in 1879. Ten years later, George Robertson Sinclair was appointed Cathedral organist. Robertson was a man of great musical ability and vision and soon set about making his presence felt. He lost no time in pointing out continuing shortcomings of the organ – worn reeds that were difficult to tune, insufficient wind chests, limited upward manual compass – and, although not in a position to help financially, the Cathedral authorities encouraged Sinclair in his quest to improve the instrument. After much work on Sinclair's part, over £2000 was raised, which allowed Willis to produce what was effectively a new organ. Despite the re-use of some pipework, a significant amount of material was new and the tonal scheme definitely bears the authentic stamp of Father Willis. The organ was the first to feature Willis's patent adjustable combination action and was dedicated in November 1892, with much music making and celebration taking place.